First prepare the meat for the filling. The rib meat and pork jowl should be cooked in a covered pot over low heat with the tomatoes, onion, bell pepper, garlic, dissolved achiote, bitter orange juice, salt and pepper. Add 1/2 or one full cup of water if necessary, and when the meat is tender, adjust the seasoning as desired. Remove from heat and let cool; the meat should be juicy and well seasoned. To prepare the dough, place the corn flour in a bowl. Add the lukewarm water, bitter orange juice and knead constantly. Slowly incorporate the melted pork drippings and salt. The dough should be very smooth and similar in texture to play-dough. If the result is too dry, add a bit of water. Remember that as the dough rests, it will become more firm. When this happens, place in a pot over medium-heat and stir with a wooden spoon for around 40 minutes. Have the banana leaves ready for assembling the nacatamales. Take two leaves and place in the form of a cross. Place a 3/4-cup portion of dough in the center, where the leaves overlap, and slightly flatten with your hand. Over the dough, add a piece of pork meat and two cubes of pork jowl. Cover with one tablespoon of sauce left from cooking the pork. To the side of the dough, place one tablespoon of soaked rice, with one slice of potato, tomato, onion and a stem of mint. Close the tamale as if it was an empanada, securing the contents well with the banana leaves, so that none of the filling falls out. Tie the nacatamales with twine to keep closed. To cook, cover the base of a large pot with a rack and place the leftover banana leaf scraps on top. Then add the prepared nacatamales followed by more banana leaves. Add enough boiling water to fill half of the pot. Cover the pot with a lid and cook over medium heat to steam the tamales for three to four hours. Remember that you’ll have to add more hot water over time, as it boils away. When finished, serve hot accompanied with pita bread. Nacatamales freeze perfectly for eating later. To reheat, place in boiling water for 20 minutes or until completely cooked. The filling can be made with chicken or just with vegetables for a vegetarian version. Traditional Nicaraguan nacatamales make an excellent Sunday breakfast that will surprise most people due to their large size – almost 10 ounces. 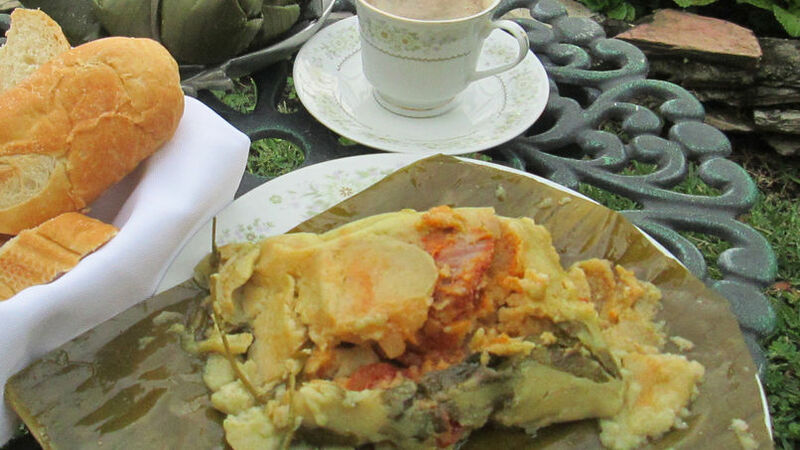 A proper nacatamal is large, always wrapped in banana leaves, and has an ultra-fine corn dough. It's usually filled with pork or chicken in adobo sauce, a bit of rice, a slice of potato and tomato, a stem of mint, raisins, prunes, olives, peanuts, chili peppers and pieces of pork jowl. According to custom, this dish is accompanied by bread and café con leche, but the type of drink served can vary according to the occasion. Some cooks add puréed potato to the dough, to give it body and volume. In recent years, vegetarian nacatamales and other interesting versions have become available as well. What's certain is that Nicaraguans love their nacatamales, and don't only enjoy them at home, but at fiestas and celebrations also. For these occasions it's normal that mini nacatalmales are served; made with the same fillings, just smaller. This cocktail-sized appetizer can be specially pre-ordered in advance or made at home. If hand-made, the family will usually help out to make the work go faster, since preparation for these tamales starts at least 24 hours in advance. Hopefully this recipe will motivate you to try preparing these nacatamales–it's an intense job, but can be shared by the whole family. So why not put your hands to work and enjoy the preparation!